Optimize business processes with the right water chiller service. North Shore businesses know they can come to United Service Co. for complete commercial water chiller services. All HVAC equipment relies on water chillers for heat exchange processes. Without water chillers involving refrigerants, modern cooling systems for HVAC and equipment cooling would not properly function. For over six decades, United Service Co. has specialized in all forms of refrigeration including water chiller technology. Talk to one of our representatives today. In commercial HVAC systems and industrial applications, water chillers play a vital role in the cool-down process. Whether you run temperature-controlled environments or work with high-temperature equipment, you may need water chillers to maintain normal operating temperatures. Our water chiller service in North Shore focuses on commercial support for all major water chiller systems. We troubleshoot, repair, and replace components in water chillers for maximum performance over time. If you notice a problem with the chiller system, we’ll send a licensed and trained technician out to your property for water chiller service in North Shore. We conduct industry-specific diagnostic testing to identify problems and recommend cost-effective solutions. If possible, we will repair your system and extend its life-expectancy. In some cases, we may recommend full system replacement for more reliable performance. New installations. If you’re building a new facility or upgrading an existing one, we offer complete installation and replacement services to keep your HVAC system in top shape. Preventative maintenance. Our technicians work on ice makers, coolers, freezers, HVAC systems, and restaurant equipment. We offer our customers custom preventative maintenance schedules to ensure performance over time. During a maintenance check, we inspect the system, recommend updates, and offer free estimates for the work. Keep your business running strong with routine HVAC maintenance activities. Repair work. Refrigerant leaks and electrical issues can prevent a chiller system from properly functioning. If you notice an issue with the chiller system, we’ll pinpoint the problem and repair it as quickly as possible. Our team strives to locate replacement parts for all major chilling system brands quickly to avoid customer downtime. 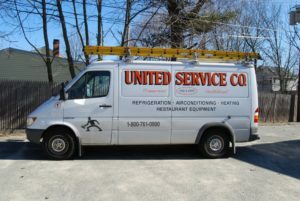 If you need water chiller service in North Shore, remember the team at United Service Co. We strive to build lasting relationships with each of our customers and reduce total HVAC costs as much as possible. Water chiller systems do more than redirect heat from the environment. They help businesses meet their energy efficiency and operational budget goals. The team at United Service Co. can help. As part of our water chiller service in North Shore, we work to offer actionable advice our customers can use to save money and grow in the local marketplace. Explore our testimonials. Come to us for more than water chiller support. As HVAC-R experts, we help our customers with industrial HVAC support, basic and complex refrigeration projects, and restaurant equipment services. If you’re interested in water chiller service, North Shore locals know to reach out to our team at (800) 761-0900 or (978) 750-5600.